Sans the disturbing scenes though, a GoT wedding can be quite the spectacle. So much attention has been poured into the details tastefully that the style transcends its medieval setting. If you’re considering throwing a Game of Thrones-inspired ceremony, here are some of the ideas that you can keep in mind as you go. Many of the wedding scenes were filmed outside Britain, but you can still rock a similar setup. Harper’s Bazaar lists some of the most spectacular wedding venues for rent in the UK which includes castles to make you feel like medieval royalty. 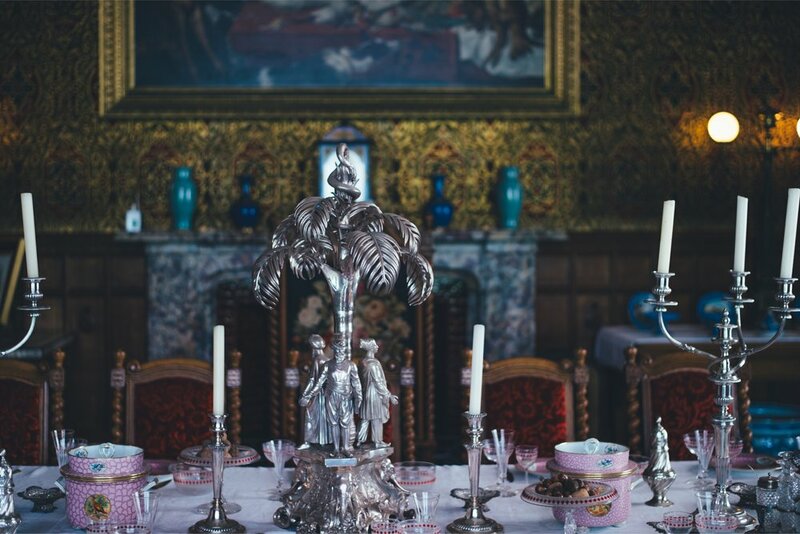 Culzean Castle in Ayrshire welcomes guests in with grand stone-walled structures; London’s The Ned has long dining tables for the ultimate feast; and Hawkstone Park Follies in Shropshire is perfect if you want a secret ceremony a la Robb and Talisa Stark. The women of the show have donned some of the most intricately designed dresses that will make anyone green with envy. Stray from the normal and channel your inner Sansa Stark with a patterned gold gown bearing her betrothed's house sigil. If you want to be more dramatic, People Magazine relayed that Sansa’s second was a white dress layered with a fur shawl that will look stunning for a winter wedding. Allure describes that the Mother of Dragons oftentimes wears her soft curls in a braided half-updo, which gives off an ethereal vibe. Dany’s platinum hair is striking on camera and one of the most copied looks from pop culture. The Queen Mother, Cersei Lannister, doesn’t fall behind with her long blonde locks often seen in twists, which reflects the conniving nature of her character. The Seven Kingdoms’ cuisine is all about traditional sumptuous meals paired with free-flowing ale and wine which is why the wedding banquets are always a merriment. We have previously noted how simple but perfectly-cooked dishes are making a resurgence as the food trend of wedding receptions. Pay an homage to the show with individual roasted Cornish game hens that will make anyone feel like a king! For a creative approach to table arrangements, consider separating your guests according to which house you think they’d belong to. You can place a map at the entrance with each of the houses or cities, and the tables can be decorated with painted dragon eggs or candelabras. The show’s focus often revolves around the great houses of Westeros and how each family has its own ways of garnering power. It will be interesting and fun to see how your guests play up to their respective characters. While the guests are seated at their tables, the bride and groom can be sat on chairs akin the Iron Throne featured on the show as well as in the officially licensed Game of Thrones title that showcases the imperious imagery at the top of its game page. After all, it's an iconic part of the story, and everything in the series comes down to who gets to sit on it in the end. So why not have it as the perfect platform to showcase the married couple to the guests? Make yours big enough for two, and show your love for GoT as well as each other by enjoying the celebration on a couple version of the Iron Throne! Indeed, the medieval fantasy genre is teeming with design inspiration just waiting to be interpreted, and the wedding industry is the latest to catch the Game of Thrones fever. Have a go at any of these ideas inspired by HBO’s fantastic show!